Did you know that 94% of all multi-channel campaigns include print? 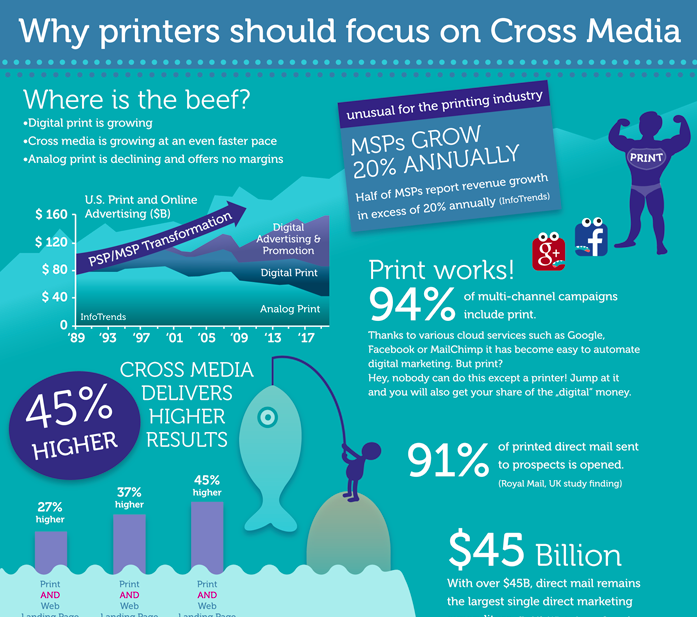 And, although 68% of print buyers are looking for cross media, only 20% of commercial printers are offering it? These and many more striking facts are part of our brand-new attractively illustrated wrap-up of studies about VDP, cross media and the printing industry. Have fun reading! If you ask any British consumer where to buy personalized greetings cards online, it ́s extremely likely that the answer will be Funky Pigeon. 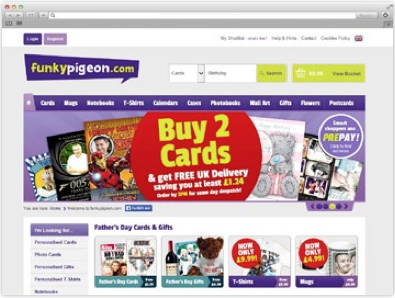 During the two years between the company starting up under its brand-name in 2008, and its sale to WHSmith in 2010, Funky Pigeon has seen unparalleled growth of sales and market share, with tens of thousands of designs and products available on its web portal. There are many Web-to-Print solutions available that you can employ in a variety of areas. In this article – and with this demonstration application – we would like to introduce you to the advantages of our own solution. One feature of DirectSmile Cross Media is that you can build your own customized applications without needing special skills or a lot of effort. Create your own printable calendar, or one for a client, right now and experience the positive impact it has. Whether it's B2C or B2B: Products with image personalization are always extremely helpful when trying to reach marketing goals. The Dental Instruments Marketing Center is a B2B portal that provides a broad variety of marketing materials to the large network of resellers of a producer of dentists' equipment. This database-driven media production center features advanced DirectSmile capabilities that range from online document configuration to data relations for user management. For the release of the new Actros truck, Mercedes Benz invited their VIP customers to a special event. As a first step, the company sent out e-mails to all VIPs.The e-mails included a link to a personal URL website (PURL). Thanks to the extensive resource management of DirectSmile Cross Media, you are able to upload, display and distribute all kinds of marketing materials such as logos, images, brochures, or presentations. The automatic conversion supports multiple types of media including EPS, PDF, CMYK-TIFs and many more. Here's one small example of a web-to-print application that was entirely built with DirectSmile: Generate your own print-ready business cards including personalized images and QR codes. Whether it's the online user interface for business cards orders, the actual print documents, or the workflow, there is no external software involved. By using DirectSmile Cross Media, you are combining the advantages of image personalization, document design and mobile websites. If you want to attract prospects or customers with Inbound Marketing and Content Marketing, then you are going to ask yourself the basic questions: WHAT sparks interest and WHEN and HOW you will reach a person. You pursue goals and know: WHO is interested in your offer and WHY you are conducting Content Marketing. Inbound and outbound are currently the hottest tags in marketing. Made famous by the call center's direct marketing campaigns, you can clearly distinguish between the dreaded outbound "cold call" and the service-oriented inbound call. Why should you make sure to check out the sales approach of all online marketing in order to optimize your inbound and outbound activities? Do you already know our App Center? The App Center features many interactive examples of applications that were built with DirectSmile. The Marketing Portal is our latest App. Even if we are talking about dental instruments, try out online how state of the art Marketing Automation really works. I guarantee that it does not hurt. High response rates demonstrate that printed advertising letters are the increasingly key success factor of Cross Media Campaigns. One reason is the mere fact that the contact time by the physical property of print media is much higher than through digital media. Once a window in the browser is closed, it stays usually closed. Now there's life in the old dog yet, and it's time to rediscover the printed items of correspondence. Thanks to Marketing Automation we can achieve a very high ROI if we use the help of Image Personalization and Variable Data Printing to be able to convert target groups into target persons. I'll show you in the following three sections, how to get the full attention of your customers with your next mailing campaigns. Berlin/Chicago/Cologne, September 06, 2013 - DirectSmile today announced that its easy-to-use marketing automation software will feature full integration with a variety of input media, as well as a variety of output media, and reliable rendering in workflows powered by the Adobe® PDF Print Engine. This month the solution will be showcased in Chicago at Print13 and in Cologne at dmexco 2013.